A series of clashes between Burmese government forces and the Ta’ang National Liberation Army (TNLA) have compelled some 300 villagers in Namtu Township, northern Shan State, to flee their homes. 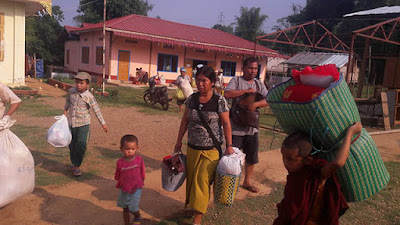 Photo by Tai Tiger- Villagers were fleeing their homes to Namtu town on May 11. They are now staying at Shwe Minta Temple, she added. The TNLA recently posted on its News and Information Department website that fighting broke out in Namtu, Mongmit, Kutkai and Mantong Township between its troops, the Burmese army and the Restoration Council of Shan State/Shan State Army (RCSS/SSA). The TNLA, also known as the Palaung Army, was among six armed groups – alongside the Myanmar Nationalities Democratic Alliance Army (MNDAA); Arakan Army (AA); Lahu Democratic Union (LDU); Arakan National Congress (ANC); and Wa National Organization (WNO) - that was excluded from signing the Nationwide Ceasefire Agreement in 2015 with the then ruling government led by President Thein Sein. According to Myanmar Peace Monitor, in 2016 a total of 309 clashes broke out between the Burmese armed forces and TNLA troops in northern Shan State. On April 10, Shan Herald reported that three villagers were reportedly killed amid fighting between the TNLA and government forces in Kyaukme Township. And earlier this month, an old woman was shot dead and three others injured in Namkham Township. Both incidents occurred in northern Shan State.